A shape and size to suit every taste. Thursday Fiberglass Pool Shapes: Explore the Possibilities! Fiberglass pools manufactured by Thursday Pools® and installed by Swim World Pools. Available in a variety of sizes, shapes, and colors, there's a Thursday Fiberglass pool for every space and setting. Precision Built, Steel Pool Molds. Thursday fiberglass pools are a solid investment in more than just their beauty. Crafted from steel rather than the usual wood, Thursday's fiberglass pool molds are precision built utilizing laser alignment and measurements throughout the construction process. Together, these factors combine to ensure the highest structural integrity of the mold and the lasting beauty of your pool. 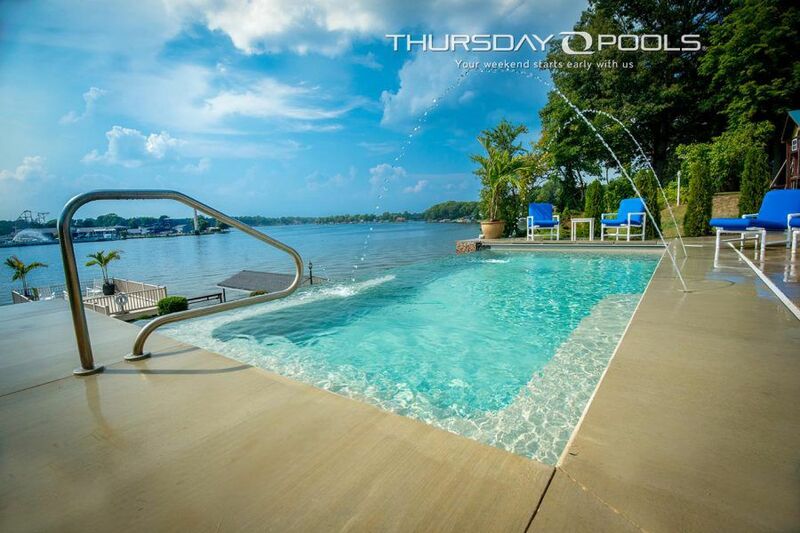 Unlike others, with their exclusive, patent-pending Fiberglass Pool Anchoring System™, Thursday Pools builds the only fiberglass pool available that protects your investment by warrantying the pool shell even when drained. To read more about Thursday's unique FPA design system, click here. Swim World Pools: authorized Thursday Pools dealer. Explore the shape gallery below and imagine the possibilities. Then contact us at Swim World Pools to discuss making your Thursday fiberglass pool a reality! Browse down through the shape gallery for detailed information on each pool. A Goliath is synonymous with big and Thursday Pools has got one that you will be craving. The Goliath is a long pool that packs more than a punch and makes an ideal lap pool. - 16' x 33', descending from 3’8″ to 6′ in one long gradual expanse. - 16' x 37', descending from 3’8″ to 6'4" in one long gradual expanse. - 16' x 41', descending from 3’8″ to 6′ 8'in one long gradual expanse. This beautiful side-entry freeform fiberglass pool design is sure to compliment any backyard. Its unique shape, alluring sun shelf and benches are a source for fun, relaxation, and stress relief. The Wellspring is sure to become your permanent stay-cation spot. - 16′ x 36′ with a gradual decline from 3’8″ in the shallow end to 5’10” in the deep end. - 16′ x 40′ with a gradual decline from 3’8″ in the shallow end to 5’10” in the deep end. The Lil Bob pool shell in the Bob series is perfect for those who want a smaller size fiberglass pool with fun features and pool designs that the entire family will enjoy. Combining a compact size and style in a beautiful pool design its practical in design and beauty will turn a few heads as well. - 13.5′ x 27.5′ pool shell design. The Lil Bob has a consistent shallow end throughout that is 4’6″ deep. Want to create your own backyard paradise? If so, the Oasis may be the perfect pool for you. Designed with the fusion of curve appeal and functionality in mind, it combines free-form elegance, open swim space, and a stylish tanning ledge to add both beauty and pleasure to any backyard. -15′ x 27′ with a gradual decline from 3’8″ in the shallow end to 5’3″ in the deep end. - 15' x 30', with a gradual decline from 3’8″ in the shallow end to 5′ 6' in the deep end in one long gradual expanse. A Cathedral is awe-inspiring. An elegantly designed pool shell insert, Thursday's Cathedral is a pool that you don’t have to kneel to fit into. With a bench built into the deep end you can go for a relaxing soak instead! - 14′ x 33′ with a gradual decline from 3’5″ in the shallow end to 5' in the deep end. - 14′ x 36′ with a gradual decline from 4’ in the shallow end to 5’4” in the deep end. Looking for an oval shaped fiberglass pool? The Titus combines fiberglass swimming pool technology with a beautiful fiberglass pool shape. Designed for both a relaxing soak while sipping a refreshment on the built-in benches and at an ideal depth for water aerobics, Titus is a one-piece pool that will make you smile whatever your plans. - 12′ x 26′ in size, with a transition from 3’5″ to 5'5” deep. - 14′ x 33′ in size, with a transition from 3’6″ to 5’10” deep. When you've found a Thursday fiberglass pool shape that captures your imagination, contact Swim World Pools and we'll make it a reality for you. Monolith means big! Thursday's Monolith is a pool with attitude that will look beautiful with your home. The Monolith model combines size and style in a beautiful pool design that features ledge seating and a convenient step rail for swimmers of all heights to enjoy shallow and deeper ends equally. The Monolith is perfect for those who want a larger-sized fiberglass swimming pool with fun features that the entire family will enjoy. -16′ x 40′ with a shallow end that slopes gracefully from a 4′ depth to a deep end that maxes out at 8’6″. We scrutinized every square inch of the design to find the proper balance of features and swim space. These measurements allowed us to create 33 percent more open swim area than similar sized fiberglass pools on the market. -16′ x 36′ with a gradual descent from 3’8″ in the shallow end to 5’6″ in the deep end. The Spirit’s flat bottom and 4′ 6″ depth makes it the perfect pool for fitness and fun. It is an ideal design and depth for a water volleyball game or a complete water aerobic exercise program. There are ample built-in benches for family and friends who just want to enjoy the day and keep cool while doing it and the double entrance makes it accommodating to any backyard layout. This truly exceptional pool embodies the fun spirit of a backyard pool party. -13.5′ by 40′ in length with a uniform, flat bottom at a depth of 4′6"
Gunite pools used to be the only way to create the vanishing edge pool. Instead, merging the popular Lil Bob model with a vanishing edge, Thursday innovates to provide you the same beauty and calming sounds without the usual hassle and maintenance in a fiberglass pool. -13′ x 27′ with a 4'6" depth throughout. Thursday's Pearl pool, like its namesake is a thing of beauty both in its looks and versatility. With a shallow deck to accommodate lounge chairs it will be your own intimate oasis while, at other times, with it's wraparound beverage bench, it will be welcome gathering place to host your friends. -15′ x 25′ with 3'6" depth throughout. If you're looking for a small patio pool, the Sea Turtle might be just the fit. Spa jet ready, its size makes it a versatile choice that can provide you with all the benefits of a traditional pool or spa at a fraction of the cost. Can be installed indoors or outdoors. -10' x 20′ with a 4′6" depth throughout. Bring the resort spa home to your own backyard with the Thursday Spa. This pool of bubbling water is spacious enough to accommodate up to nine of your friends, but the soothing relaxation it offers is inviting and enjoyable enough to enjoy on your own. -9′ x 9′ with 3'2" depth throughout. Thursday's Wading pool makes a statement when arranged next to a larger pool and its shallow depth ensures fun for the entire family - small and big kids included! -9′ x 9′.stepping down to a depth of 3' 6" throughout. The Wet Deck is a versatile shallow pool suited to multiple uses when incorporated with other Thursday Pools fiberglass swimming pools. Create different pool transitions in your background and experience various backyard pool designs. -8' x 14' with a 1' depth throughout.